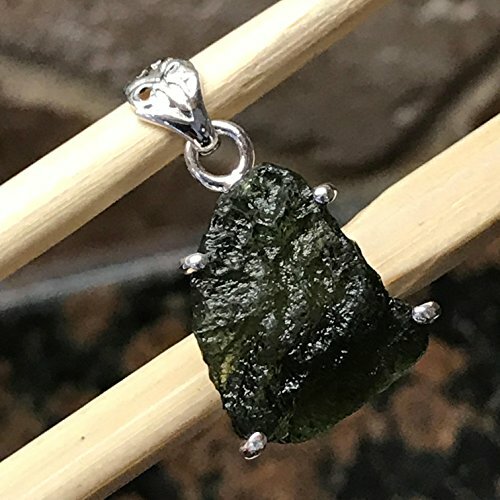 Handmade, natural product Stone: Green Moldavite Metal: 925 Solid Sterling Silver , The pendant is genuine earth mined . The pendant are made of solid sterling silver. This item is brand new. It is rough, cluster, healing stone. Moldavite is a translucent, olive/green vitreous substance naturally shaped as a rough droplet. Found by patient scanning of sandpits and fields in the Czech Republic, this extra-terrestrial glass was formed by the fusion of a meteorite with the earth millions of years ago. Treasured for centuries by various cultures, it has been used for many purposes - from arrow-heads to lucky talismans. Gram-for-gram, Moldavite is rarer than a diamond, as only 50 tonnes were ever formed on earth.